Normally a low-key auto show, Subaru is planning a fairly big reveal at next month’s Chicago Auto Show. The automaker will reveal the redesigned 2020 Subaru Legacy, which is showing off its new, Tesla-like big screen in the above new teaser shot. 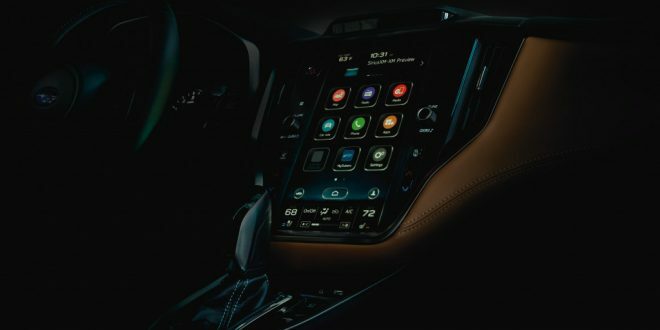 Aside from the simple fact there is a massive display in the car, it also appears said screen is going to consume most of the radio and HVAC controls. It also appears Subaru’s driver attention monitor will be found in the new Legacy, as noted with the hump above the screen that houses the necessary sensors. Assuming this massive display comes standard in the new Legacy, it will be among the first mainstream vehicles to do so. Ram offers an equally large display in higher-end models, while Ford is also rolling out a new, optional vertical display in the 2020 Explorer. Expect more details and images of the 2020 Subaru Legacy next week out of the Chicago Auto Show.